Michael Liu, Jane Ng, Viola Jing and Keith Gerver have authored a Clients & Friends Memo to discuss the latest trends in reviews conducted by the Committee on Foreign Investment in the United States (CFIUS) for Chinese investors contemplating possible investments in U.S. assets. The Memo provides a recap of the CFIUS framework and process, and some recommendations to avoid unnecessary complications and after-deal scrutiny from CFIUS. On February 26, 2015, the Committee on Foreign Investment in the United States (“CFIUS”) - the interagency body charged with reviewing the impact on U.S. national security of any merger, acquisition or takeover that could result in the control of a U.S. business by a foreign person (including corporations) - issued its 2015 annual report to Congress. The report, which covers 2013, confirms the trend that CFIUS is focusing more attention on investment into the United States from the People’s Republic of China (“PRC” or “China”). 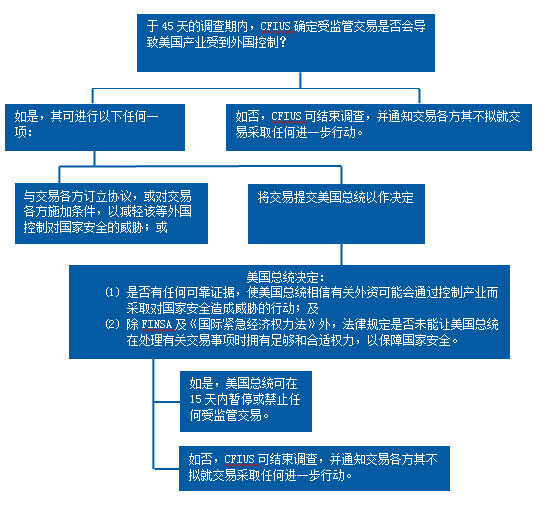 As China continues to be one of the most active investors in the United States and CFIUS continues to closely scrutinize transactions involving Chinese acquirers, this Clients & Friends Memo summarizes the latest CFIUS trends for Chinese investors contemplating possible investments in U.S. assets, and provides a recap of the CFIUS framework and process. Under section 721 of the Defense Production Act of 1950, as amended by the Foreign Investment and National Security Act of 2007 (“FINSA”), 50 U.S.C. App. § 2170, CFIUS is charged with reviewing “covered transactions” - mergers, acquisitions or takeovers by or with any foreign person that could result in foreign control of any person engaged in interstate commerce in the United States - to determine the effects of such transactions on the national security of the United States, taking into consideration 11 statutory factors.5 A CFIUS review of a covered transaction can either be initiated by CFIUS itself - even after a deal has closed - or through a voluntary written notice jointly filed by the parties to the transaction.6 Indeed, CFIUS is not obligated to review all foreign direct investment that may be a “covered transaction” as defined by FINSA, nor are parties to such transactions required to file a written notification of the deal with CFIUS. The review and investigation processes of CFIUS are outlined below. “Control”—Transactions solely for the purpose of passive investment with a foreign person holding ten percent or less of the outstanding voting interest in a U.S. business are not “covered transactions”. Second, the term “national security” is a notoriously amorphous concept. FINSA does not offer a definition, other than to note that the term includes “those issues relating to ‘homeland security’ including its application to critical infrastructure.”12 Given the inherent breadth of the concept, many transactions that might not at first seem to involve national security issues could come within CFIUS’s purview, as demonstrated most recently by the 2013 acquisition of food processor Smithfield Food Inc. by China’s Shuanghui International Holdings Ltd. Due to the potential impact on “food security,” which some commentators argued should be seen as an aspect of national security, the parties filed a voluntary notice with CFIUS; CFIUS ultimately did not oppose the transaction. Third, the term “critical infrastructure” is itself vague, defined to mean “systems and assets, whether physical or virtual, so vital to the United States that the incapacity or destruction of such systems or assets would have a debilitating impact on national security.”13 Indeed, nearly all aspects of the U.S. economy could fall within one of the 16 critical infrastructure sectors identified by Presidential Policy Directive/PPD 21, 'Critical Infrastructure and Resilience'. As such, many more deals are likely to come under CFIUS review. According to the 2015 annual report recently released by CFIUS , during 2013, 97 notices of transactions were filed with CFIUS which CFIUS determined were “covered transactions,” down from the five-year high of 114 set in 2012. Of the 97 notices filed, 48 resulted in 45-day investigations, a slight increase from the 45 investigations conducted in 2012. But as a percentage of filed notices - 49% - the number of investigations represent a marked increase over previous years (39% in 2012, 36% in 2011, 38% in 2010, and 38% in 2009). The 2015 annual report partly attributes the percentage rise to five cases proceeding to the investigation stage because of the October 2013 government shutdown, which prevented CFIUS from completing the initial review of those cases within the statutory 30-day period. Even not taking into account those five cases, however, the percentage of notices that proceeded to investigation would have risen to 44% in 2013. On the other hand, of the 48 notices that proceeded to an investigation, only five were withdrawn after the investigation had commenced, a steep drop from 2012, where 20 notices were withdrawn after an investigation had begun. In total, eight notices were withdrawn in 2013; the parties in only one of those eight cases re-filed a new notice in 2014. As reported in the 2015 annual report, parties requested withdrawals for a number of reasons, for example, where (a) the parties were unable to address all of the CFIUS' outstanding national security concerns within the initial 30-day review period or 45-day investigation period; (b) there was a material change in the terms of the transaction; (c) the parties abandoned the transaction for commercial reasons; (d) the parties did not want to abide by CFIUS' proposed mitigation; or (e) CFIUS recommended that the President suspend or prohibit the transaction. The decline in withdrawn notices indicates either that CFIUS was satisfied that the covered transactions in question did not impair U.S. national security, or, more likely, CFIUS and the parties to the transactions were able to reach agreement regarding mitigation. In 2013, for the second year in a row, Chinese investment in the United States accounted for the largest number of covered transactions reviewed by CFIUS. China also surpassed the United Kingdom in the total number of covered transactions reviewed by CFIUS for the period between 2011-2013. The 2015 annual report provides additional insight into what mitigation measures CFIUS might request parties to a covered transaction to adopt to assuage CFIUS concerns over foreign control. While the list of example mitigation measures remained mostly unchanged from the 2013 annual report, there was a notable addition that indicates a potentially more aggressive stance by CFIUS with respect to mitigation measures. Specifically, CFIUS required parties to at least one of the 11 covered transactions in which mitigation measures were applied in 2014 to provide the U.S. government “with the right to review certain business decisions and object if they raise national security concerns.” In other words, this mitigation measure would allow the U.S. government to take part in the management of the business. New findings contained in the “Critical Technologies” section of the 2015 annual report also suggest a more aggressive approach by CFIUS in the future, especially with respect to covered transactions involving businesses in countries whose governments are believed to engage in economic espionage. In a departure from the conclusion in the 2013 annual report, the U.S. Intelligence Community (“USIC”) now “believes there may be an effort among foreign governments or companies” to acquire U.S. companies involved in research, development or production of certain critical technologies. “Critical technologies” generally include defense goods and services controlled on the U.S. Munitions List, certain export-controlled military, chemical and biological weapons, missile and nuclear technologies, and select agents and toxins. The 2015 annual report further notes that the USIC “judges that foreign governments are extremely likely to continue to use a range of collection methods to obtain critical U.S. technologies.” As such, CFIUS is likely to scrutinize covered transactions involving critical technology in more depth going forward. While CFIUS contends that it reviews transactions on a “case-by-case” basis, the 2015 annual report further supports the notion that it has been paying particularly close attention to deals that could result in Chinese investors controlling U.S. businesses. 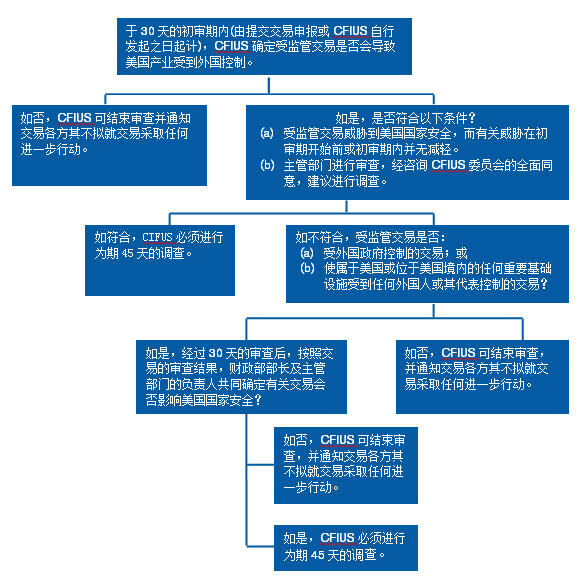 To avoid unnecessary complications and after-deal scrutiny from CFIUS, Chinese investors should strongly consider voluntarily filing with CFIUS if they are involved in a merger, acquisition or takeover that involves national security - defined broadly - that would result in foreign control - again, considered broadly - of a U.S. business. Indeed, CFIUS staff are known to scour the financial press, and if they find a deal that could be considered a covered transaction that might affect national security, they will likely contact the parties to request a filing or even unilaterally open a review. To ensure smooth dealings with CFIUS, the parties should propose methods of mitigation early in the review process to ensure that certain identified issues are dealt with. 1 A.T. Kearney, The 2014 A.T. Kearny Foreign Direct Investment Confidence Index: Ready for Takeoff 1 (2014), available at www.atkearney.com/documents/10192/4572735/Ready+for+Takeoff+-+FDICI+2014.pdf/e921968a-5bfe-4860-ac51-10ec5c396e95. 2 Organization for International Investment, Foreign Direct Investment in the United States – 2014 Report 5 (2014), available at www.ofii.org/sites/default/files/FDIUS2014.pdf. 4 David Dollar, Why So Little Investment between the United States and China?, Up Front (Feb. 26, 2015, 1:42 PM), http://www.brookings.edu/blogs/up-front/posts/2015/02/26-investment-between-us-and-china-dollar. 5 50 U.S.C. App. §§ 2170(a)(3), (b)(A)(i), (f)(1)-(11). The 11 factors, codified at 50 U.S.C. App. § 2170(f), generally fall into three categories: the nature of the foreign investor, the vulnerability of the target, and impact of the deal on both U.S. national security and global security. 6 Id. at § 2170(b)(1)(A)-(E). 7 Id. at § 2170(a)(2). 8 Regulations Pertaining to Mergers, Acquisition, and Takeovers by Foreign Persons, 73 Fed. Reg. 70,704 (Nov. 21, 2008) (to be codified at 31 C.F.R. § 800). 9 31 C.F.R. § 800.204(a). 10 Id. at § 800.302(b). 11 Id. at § 800.223. 12 50 U.S.C. § 2170(a)(5). 13 Id. at § 2170(a)(6). 4 David Dollar， 《为何中美之间外商投资相对较少?》(Why So Little Investment Between the United States and China? ), Up Front (Feb. 26, 2015, 1:42 PM), http://www.brookings.edu/blogs/up-front/posts/2015/02/26-investment-between-us-and-china-dollar.